Hot and cold work together in spas to help relax tired muscles, soothe aches and pains and re-invigorate breathing, which is why saunas, steam rooms, salt grottos and snow cells are so popular on board ships. Spas are all about helping you feel better (and often look better too). Treatments and therapies are designed to help you relax, to give your poor tired body a chance to revive with a good massage, warm wrap or invigorating scrub. Plus they are there to pamper you with scented oils and perfumed lotions not to mention the attention paid to face, brows, hands and feet. There is also a more therapeutic side where many of the offerings can do great things for aching joints and knotted muscles, without anybody working on you, kneading or manipulating those troubled areas. For this you can simply book yourself time in a sauna, a steam room, a hammam or a salt cave and lie down and relax allowing the heat to work its wonders. There are ice caves and snow rooms which are not quite so relaxing but wonderfully energising and help in muscle relief and to improve circulation. Most spas on cruise ships have at least one such room of improvement which can be used before or after treatments. They can also be effective on their own, and have been used in one form or another for centuries. Many regions and cultures throughout the world have their own traditions, rituals and practices for cleansing and purification. Some use mud, some sand, some leaves and herbs, but all use water and heat and consequently steam. From as far back as 25BC when the Romans made their first stab at communal bathing with balnae which included the warm tepidarium, and the hot laconium the whole process of sweating out toxins and impurities has been available from Japan to northern Finland, and from the sweat lodges of North America to the hammams of the Middle East. So little wonder that we now have them on ships – although nowadays they are a lot more refined. saunas tend to be very traditional, made from classic cedar wood and infused with herbs. Instead of rushing out into the snow to be beaten with birch twigs, you simply head for a cold plunge pool or stand under an icy shower. unless you’re a passenger on Viking star, which has the first snow room at sea, or you’re planning to cruise on Norwegian escape, which will also have one. In any case, it is always advisable to take a few moments between the heat of the sauna and the coldness of the water; try not to fling yourself into the cold water but opt for a gradual immersion. It is important that you do so, as cooling down is just as important as experiencing the heat. saunas are very much part of Nordic culture and in fact across Finland, sweden and Norway many homes have their own sauna. While our northern european neighbours tend to throw caution to the wind and head for the heat in their birthday suits, the Brits are much more circumspect, which is why most on-board saunas require bathing costumes or towels to be worn. (although not on the germanic europa 2, for one). steam rooms, obviously, are humid and it is up to the individual which they prefer. each offers the therapeutic elements of helping circulation as the blood vessels dilate. The heat opens the pores of the skin too, while the cold shower afterwards closes them, allowing any hidden dirt and dead cells to be removed. some saunas are infused with eucalyptus which helps the respiratory system and allows for easier breathing. If you opt for a hammam or Rasul, the Moorish or North african version of a steam room, you will also get a mud mask all over your body and a good invigorating scrub with a mitt. You will feel not just squeaky clean but totally relaxed afterwards. Relaxation is the name of the game after such treatments, and all you will want to do is lie somewhere warm, wrapped in blankets and sipping a herbal tea. 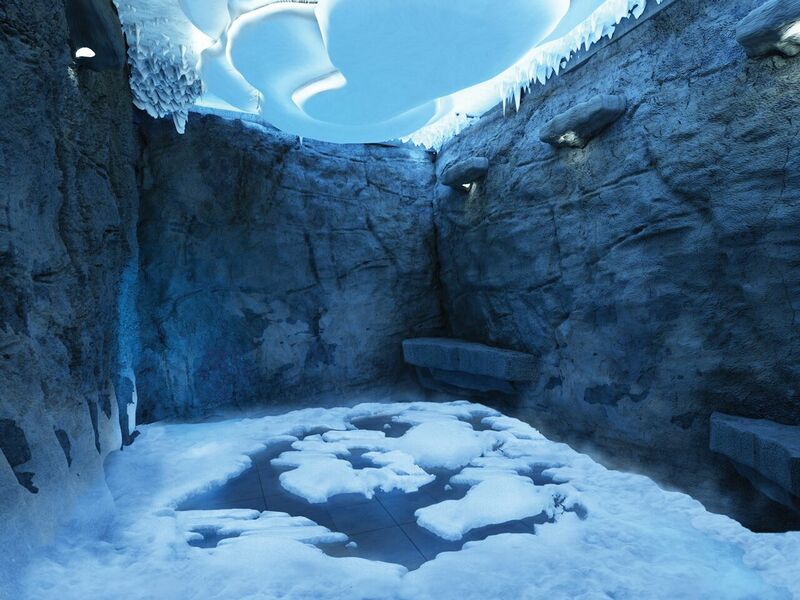 More and more spas are beginning to introduce salt and snow rooms. Like their warmer versions these also help increase circulation and relax aching joints and muscles; the salt caves in particular help strengthen the immune system and improve our respiratory workings, while at the same time having a beneficial effect on problem skin. In the micro-climate of the salt grotto on Norwegian getaway, an aerosol dispenses negatively ionised salt particles as passengers lie on heated beds and allow the salt to do its work. For me, the snow room with its slightly more vigorous approach, has one distinct advantage advantage over pools and showers – simply because it looks so beautiful! A renowned author and journalist Jo has previously edited Woman, Options, and The Observer magazine.